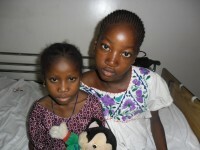 This is a picture of a young 13 year old Malian girl named Seiba (on the right). Seiba has a heart condition and was brought to the Orphelinat Niaber by her mother. We are trying to secure medical treatment for young Seiba. She is a very sweet and gentle soul.